This plan is drawn for the courses Blogging and Social Media Marketing 1 & 2. These two 3-credit courses are mainly virtual courses in blogging and social media marketing. Course 1 is offered in period 1 and Course 2 in period 2. It is the first time they are being offer at HAAGA-HELIA University of Applied Sciences available for all students from all campuses. The response for this course has been overwhelming. More than 55 students expressed interest to join the course and 50 were selected after a pre-assignment to participate in the course(s). The students had the possibility to enroll to one or both courses, therefore aiming either at 3 or 6 credits of workload. A 3-cr course equals to 81 hours of work and a 6-cr course to 162 hours of student work. The themes of this course were defined by me as an experienced professional blogger who has been teaching a Blogging course on Porvoo Campus as well as Degree Programme Director from Haaga Campus Mrs. Pirkko Salo and input from the Communications Office of HAAGA-HELIA. Mrs. Salo wished for a free-choice virtual course that would be available to all students accepted in HAAGA-HELIA even those who are now starting their studies. Usually free-choice courses are open to students in their second or third semester onwards. Having a virtual course available for first semester students would give an opportunity to students who were accepted into HAAGA-HELIA but for a variety of reasons are not able to attend their first semester (e.g. Visa problems) to take this Blogging and Social Media Marketing course and attend virtually from distance. This way they would achieve credits for their studies, they would have the possibility to interact with their classmates and ‘get to know’ them from their blog posts. The same applies the other way around, where students studying in HAAGA-HELIA could get to know their classmates in other parts of the world. Also, this is great for networking and team-building. When a student who was virtually attending returns to Finland and starts working on projects, his/her classmates know already who the person is and what are his/her strengths. Also, as the responsible teacher for the course, I have asked the Communications Office of HAAGA-HELIA to have an input in the objectives and content for the course. The nature of the knowledge created in the Blogging and Social Media Marketing course is valuable for the students personal development as well as their professional life. Blogging helps the students create content in English, express themselves as well as create new contacts on a personal level. Professional, blogging and social media marketing are skills necessary in their professional lives. Special arrangements were made in order to accommodate the needs of the different students. Due to different life and professional situations of the students participating in the course, students’ personal needs were taken into consideration when planning the course. Also, new situations have arisen and negotiations between me –as the teacher- and the student were made. For instance, one student has been doing her exchange semester abroad half a planet away and one student had some personal issues that prevented them from accomplishing all the tasks for the HAAGA-HELIA Ambassadors blog. These students became Editors of the HAAGA-HELIA Ambassadors blog, which allowed them to write only 15 instead of 20 of the blogging assignments and, in addition, edit and proofread the blog posts of their fellow students before publishing them. Also, the student who applied for APL was also appointed Editor of the blog, due also to the fact that he is a native speaker. Last, one more native-English speaker was chosen as an Editor. The students were given 2 lectures on Blogging and Social Media Marketing in contact hours on Haaga Campus. The second contact day was broadcasted live on Google+ Hangout on Air and was exported as 3 youtube videos (#1, #2, #3), which were posted in our learning platform Moodle. A couple of contact hours will be offered for course 2 in period 2. Material in the form of a Prezi as well as an extensive bibliography consisting of literature and electronic sources was also provided. One student who wished to progress faster in his studies, requested APL for both courses, which means 6cr in total and 162 hours of work; therefore, I recognized his own blog and social media activity for parts b) and c) after he demonstrated his competences in a guest lecture in real-life for my Blogging and Social Media Marketing students on Haaga Campus, where you present your blog and social media marketing efforts as well as addressing the learning outcomes of the courses (according to the course descriptions). Also, he became an Editor of the HH Ambassadors blog that was created was to increase the visibility of HH and word-of-mouth created by our students. Since he was a native-English speaker with experience in blogging, he helped the other Editors in improving the quality of the content published on our blog. As teaching methods, since the course(s) were mainly virtual Self-directed learning, distance learning, and a handful of lectures comprised the teaching elements. Students were given independency to create their own deadlines of accomplishing all the blogging assignments and social media marketing tasks. At the beginning of the course they created their own Editorial calendars, an excel spreadsheet that allowed them to decide which blogging assignment they will accomplish, how and by when. Then, also had to share their decisions, so that there would not be similar topics posted on the same day or week by different students. 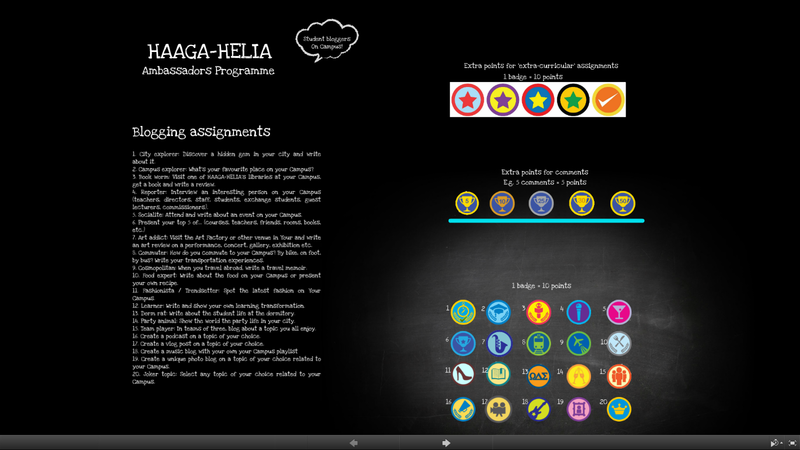 These are the assignments for the HAAGA-HELIA Ambassadors blog, which were created in order to allow the student to provide interesting content from their student life in their campuses as well as their lives as well as explore a variety of topics and ways to blog (from writing posts, to video blogging and creating podcasts). Also, all posts had photos taken by the students or from Flickr under Creative Commons Attribution license. The importance of photos and copyrights was also one of the course contents. City explorer: Discover a hidden gem in your city and write about it. Campus explorer: What’s your favourite place on your Campus? Book worm: Visit one of HAAGA-HELIA’s libraries at your Campus, get a book and write a review. Reporter: Interview an interesting person on your Campus (teachers, directors, staff, students, exchange students, guest lecturers, commissioners). Socialite: Attend and write about an event on your Campus. Art addict: Visit the Art Factory or other venue in Your and write an art review on a performance, concert, gallery, exhibition etc. Commuter: How do you commute to your Campus? By bike, on foot, by bus? Write your transportation experiences. Cosmopolitan: When you travel abroad, write a travel memoir. Food expert: Write about the food on your Campus or present your own recipe. Fashionista / Trendsetter: Spot the latest fashion on Your Campus. Learner: Write and show your own learning transformation. Dorm rat: Write about the student life at the dormitory. Party animal: Show the world the party life in your city. Team player: In teams of three, blog about a topic you all enjoy. Create a podcast on a topic of your choice. Create a vlog post on a topic of your choice. Create a unique photo blog on a topic of your choice related to your Campus. Joker topic: Select any topic of your choice related to your Campus. You can see how the badges and point system works as well as how the virtual passports look like in this prezi! My role in this particular course was a teacher, mentor and fellow blogger. I have taught and provided knowledge through my academic and practical knowledge and experience as a blogger for 11 years. For the development of this course, I benchmarked ideas from working life and blogging campaigns used by successful international companies. In particular, I have been inspired by the LIFEBOOK4Life and Master Your Business campaigns by Fujitsu. I am a Silver Status Insider (blogger) for Fujitsu since 2010 after being selected from a large number of international independent bloggers all over the world. Both campaigns offer a gamified experience for blogging and I have incorporated similar element to my Blogging and Social Media Marketing course(s). To spark the interest of the students and keep them motivated, I have created a gamified experience of blogging, in which students that write a blog post are awarded a virtual badge (sticker) on their virtual passport. The more comments, likes, shares their blog posts receive from the blogosphere (their readers) the more points they receive. Also, as a teacher, I have created the ‘<3 Loved by the teacher’ badge that I hand out to students for their personal blogs, whose blog posts I like! This badge gives them 50 extra points. Last, their blog statistics award them points, too. After they count all their badges and points, they will be ranked and they will be assessed according to their own performance. This is an innovative approach in assessing the students’ work since the assessment is an open process to the whole world and it depends on their quality of blog posts as well as their social media marketing efforts. The better writers and the most hard-working students in social media in terms of sharing their articles will be assessed positively. This creates self-motivation, enhances creativity and the sense of ownership of their content and their efforts in promoting their work. I am providing feedback to students personally via email or Moodle as well as commenting on their blog posts. I have chosen this course as part of my pedagogical studies because it is the first time I offer this course and I needed to re-think about the course development and plan. I am still learning about ways to offer virtual courses and using technological tools, students’ feedback and my own personal experience. My sessions can be followed in the above YouTube clips, given that this is mainly a virtual course. Also, I will be inviting all my team members, guidance counsellor, students from our vocational teacher education programme as well as my absent students to ‘attend’ the virtual contact hours on Thursday, April 3 from 14:00-15:00. I will broadcast live via Google+ Hangout On Air. I expect to collect feedback from comments written below the video or in written form via Moodle at a later stage. Hmm, did my previous comment get lost in the ether, or was it caught in moderation? Anyway, more on the theme next week face-to-face and on Moodle later on. Irmeli, there is no comment pending for moderation. Can you please resent it? did you notice that I finally remembered to give you some feedback on this plan on Moodle?